Originally Tyketto vocalist Danny Vaughn had scheduled “Reprise” for an April 5th release, but the response has been so favourable that he wanted to do something special. This is going to delay the release of the CD by a couple of weeks, but it’ll be worth it! The first print run of “Reprise” will be limited to just 500 copies and the artwork that you see above will only be used for those 500 copies and no more, those printed after that will have different artwork making the initial run very rare and very collectable. After the amazing response to the news that HardRockHouse were able to offer a limited number of The Last Sunset signed by all four original Tyketto members, they’ve spent today talking with the guys from the Vaughn band responsible for recording both Soldiers And Sailors On Riverside and Fearless and the limited edition 500 copies will also all be individually signed by three of the guys, Danny Vaughn, Michael Clayton Arbeeny and guitarist PJ Ziterosa. Again this is only for these 500 copies of the first print run and no more. So HardRockHouse are delaying the release until April 26th and we hope you don’t mind the wait! 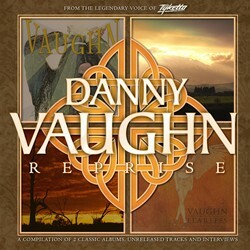 Reprise is available to pre-order via www.hardrockhouse.com/Shop.htm. In other news, HardRockHouse will also have available from mid April a very limited number of the Tyketto album “The last Sunset” all of which have been signed by the four original members of the band, Danny Vaughn, Michael Clayton Arbeeny, Brooke St. James and Jimi Kennedy. With less than 100 copies available these are available to pre-order now on a strictly first come first served basis via www.hardrockhouse.com/TheLastSunset.htm.